Justin Meek was at the Borderline Bar. 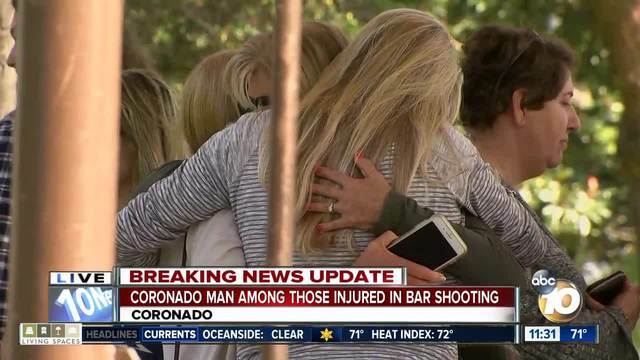 CORONADO, Calif. (KGTV) - A Coronado native is among the 12 people killed in the Thousand Oaks country bar shooting, according to California Lutheran University. Justin Meek, 23, was working as a bouncer at Borderline Bar and Grill when Ian David Long walked in and opened fire. Witnesses reported that Meek broke out windows to help survivors escape. Meek initially survived the shooting and was reported in critical condition before the university confirmed his death Thursday morning. Friends and family gathered for a vigil at Coronado’s Spreckels Park. “Justin is a great kid. Really sweet and full of life…big in music and a big part of the community,” a friend told 10News. According to the WayUp website , Meek was a recent graduate of California Lutheran University, an Eagle Scout, and a former City of Coronado and Coronado High School lifeguard. He also performed as Coronado High’s “Mr. Tiki” mascot before graduating in 2014.